I love Sundays in the Fall! You’ll often find me watching the New Orleans Saints on TV, cooking a big meal (today that is mushroom lasagna) and getting ready for the work week. Each week it never fails me to start experiencing the Sunday Blues around 430-5pm! It stems from my childhood, dreading going back to school after playing with my Barbies all weekend. But today is such a beautiful day, I want to wear something to remind me to keep on shining! Today, as the first entry in my Nail Polish-A-Day Challenge, I’m sporting a glittery gold hue from Orly called Luxe! It shimmers in the sun, it makes me think of the leaves turning to gold and even though they lost in a well-played game Thursday night against the Packers, this ones for the boys! Who Dat! I also love that gold and glitter are moving their way to the front of the line for this Fall’s must have colors. Starting off the week with a bang of solid gold! It’s been exactly two months since my wardrobe journey began. I’ve been immersed in a crash course of high fashion, beauty tips and working within a strict shopping budget. I tell my students ‘My expectations of you have exceeded beyond the scope of this class!’ Well, as a budding fashionista, I’m patting myself on the back today for exceeding my own expectations in such a short time. Never did I think I could come so far and I’m only getting started. Not to be a Debbie Downer, but this post is bittersweet for me. Today is August 29, 2011 and six years ago on this date, I sat in my brother’s LSU apartment, with my parents, and my now sister-in-law, Tiffany, as we watched our beloved city of New Orleans flood. We sat there empty of all material possessions but as a family. I thought I was only going away for 48 hours, not 3 weeks, so I didn’t take anything. I had the clothes on my back, which late August in New Orleans, means as little as possible. Prior to that date, life was fearless and I shopped and celebrated life with not a care in the world. I was invincible and had never experienced much pain and heartbreak. I didn’t know what it was like to feel loss. That day marked a huge change in my life. I began to look at everything differently. Life became sad to me. But I also looked at each day glad to be alive and somehow having no material possessions became a liberating experience. It felt unnecessary to have anything of value and as I moved forward, I tried to get by with the bare minimum. Clothes were no longer a personal statement, but a necessity so I refused to buy anything of value, in fear that it could all be taken away without a moment’s notice. But healing takes time and I eventually woke up one day and realized life could pass me by and I didn’t want to miss out on one of my favorite past times: Retail Therapy! Nothing extravagant, just a boost of confidence of owning something new. And it has taken six years to finally get to that point again. I spent Sunday afternoon in Lenox Mall, with the attitude that it is okay to splurge on myself from time to time. After three hours, some great deals and trips in and out almost every store, I walked away with some new basics to help me move forward for the next six years! Today’s post originally started off with different intentions, but I got a little off track and self-reflective instead. Thanks for listening and in return I would love to share with you my latest spree! L’aissez les bon temps roulez! 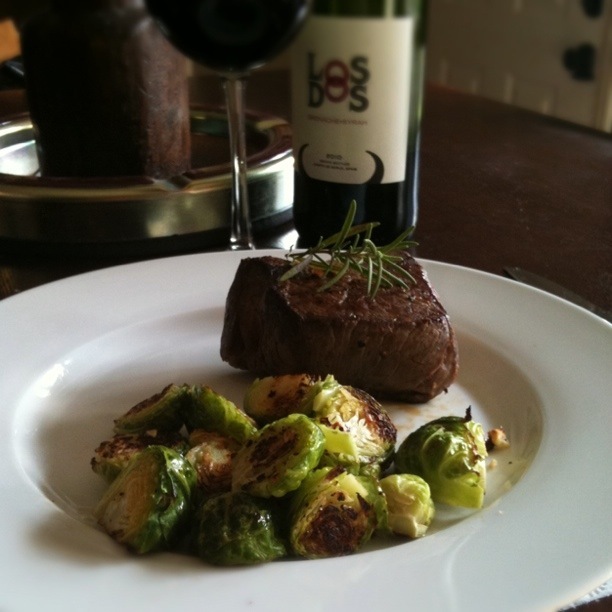 Glorious top sirloin cooked to a perfect medium rare, brussel sprouts roasted in garlic and olive oil and a fancy $6 bottle of Los Dos Grenache (haha, maybe not fancy, but $6!). This entire meal, wine included, cost me less than $15 and nothing was cooked in butter, so it was healthy too! Okay, Okay, save some energy and drool for what’s about to come! I decided to do a little shopping Friday after work. I had a few left over Macy’s gift cards and I’ve been obsessing almost daily over some clothes from Zara. I cannot stand to go to the mall on the weekends so I figured Friday evening around 7 would be empty! IT WAS PACKED! I guess people go to Lenox Mall before going out or they just walk around in the dark mall with sunglasses on. I was surprised but I knew it would still be better than a Saturday afternoon. First up, Zara! There are just a few Zara stores nationwide and here in Atlanta we are lucky enough to have one in the Neiman Marcus wing. I thought about going into the Hermes boutique but it would only make me sad. I have been obsessing about Zara’s leather bowling bag for weeks now and it was only $50 so I figured I had to have it. I’d only been in Zara once before and I remember it being a bit of a mess, but I decided to give it another try. It was messier than I’ve ever seen. It reminded me of a trip to a Charlotte Russe a few years back: clothes strewn all over the place, nothing color coordinated, just an overall disappointing shopping experience. In my previous posting, “Throw Me a Pity Party, Please”, I also had seen a red Zara sweater that was $15. Well I saw it, and it probably was worth pennies. The material was crap, no shape, just plain awful! This wasn’t going well. I looked everywhere for the bag with no luck. I saw a similar one and if it was any indication of what the other one was like, I wasn’t going to be missing much! However, as I was about to walk out, I spotted a pair of shoes that I thought looked cute so I walked over to try them on. I fell in love. 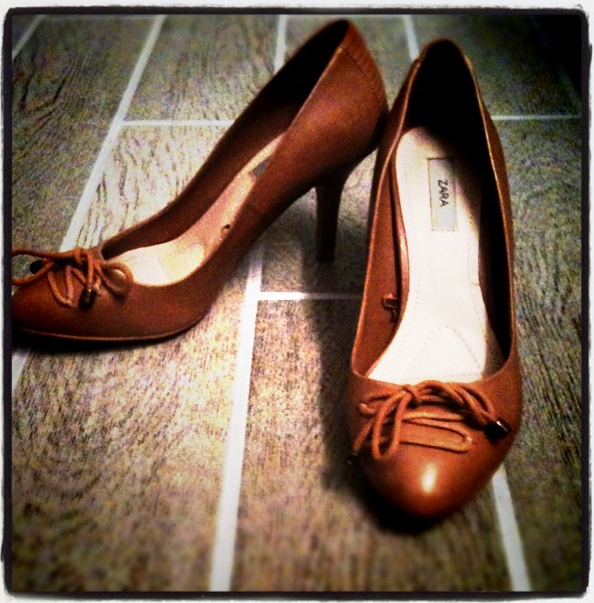 A cute neutral pump, in my size no less! and get this $10!!!! Let me tell you again! TEN DOLLARS! And they are comfortable! Maybe these shoes walked in from a different store because they certainly didn’t belong in the mess that is ZARA! Card swiped! NEXT! It always takes me that first purchase to get going. I often have no luck or I need to go through every store before I can consider making a purchase just in case there’s something better at the next store. Plus, I really don’t like to return stuff. It’s always such a hassle. OK! My next mission was a purse. I headed over to Macy’s and I remembered that I had about $50 worth of gift cards so I figured I could score a new purse for a really good deal. Purses are not really my thing. I’m learning, but if it can’t be a Birkin, I might as well be carrying plastic shopping bags. I have to be in the right mood for a purse too. I buy one maybe every 2-3 years. It’s just hard to obsess over but I’m learning how important of an accessory it is to have. My budget for this next find was around $100. Not a lot by any means, but I’ve got $50 in gift cards so I only want to spend about $50! Cheapskate, I know. I scoured the racks and racks of stuff. Ugly, I tell you. I headed to the Fossil section because they make cute bags so I focused on that. I am currently carrying a black izod top handle bowling style bag and it’s coming out the sides with receipts, coins, a french translation guide among other junk. I am a believer that the bigger the bowl, the bigger the fish so I decided to downsize and try and find a purse that would allow me to fit the bare minimum. In fact, in college, my purse of choice was a wallet on a string! Can you believe that? After picking up things I couldn’t afford and walking back and forth over to the mirror to make sure I looked okay carrying my purse (from my car to the office, my car to the front door) I fell in love with an orange leather Fossil purse. It’s cute, petite and I’ve never had anything real leather and it was $40! I’m sure you are laughing at me, but this is a huge step for me. I pushed aside looking for something utilitarian and went for cute and functional for once. Feast your eyes on her! She’s so cute and the best part is that I don’t even need to use a wallet with it! hahaha, are you laughing even harder? 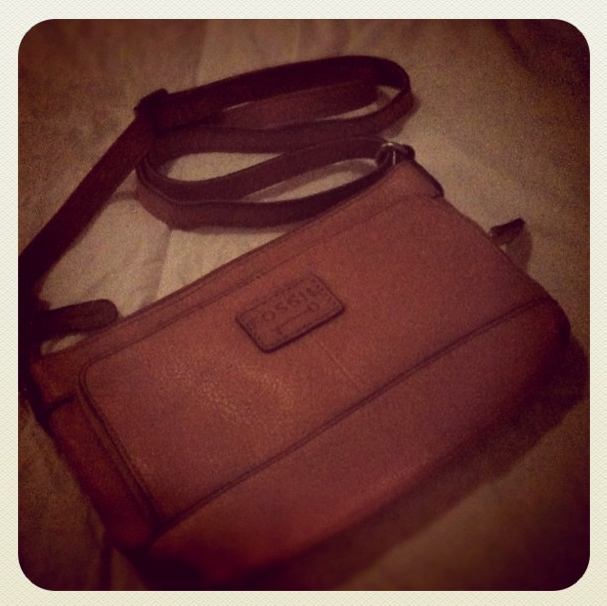 Some people spend more on a wallet than 5 purses like this! But not me, I can put everything inside and it feels like I’m carrying nothing, which is ideal! It’s the inflated version of a wallet on a string! Parfait! Tres Bien! Magnifique! (And it still holds my french translation guide, for moments like these). Wow, I’m telling you what, life is good. I walked away with a new purse and shoes for $50! Stay tuned because it got me on a roll for another big purchase that’s on the way thanks to topshop. Not sure if I’ll get it before I leave town, but I’ll be sure to critique them (hint, hint) good or bad when I get back.